Since Lena made the decision not to choose between light and dark, the world has not been the same. The Caster world has become a twisted place with powers not working as they should. And even the mortal world knows something strange has happened with heat waves and lumbers attacking every bit of vegetation. If Ethan and Lena want to fix the chaos caused, one of them with have to make a sacrifice and it will not be easy. Sometimes there is no going back and once a decision is made you have to stick to its consequences, no one knows that more than they do, and there is no happy ending following the consequences of their actions this time. It has been three long, book filled years since I read the first two Caster Chronicles books, and that showed when I started reading Beautiful Chaos. The story took a long time to come back to me and though I remembered loving them, I honestly didn’t have a clue where things left off. Beautiful Chaos doesn’t do much to remind you of everything, though some things that happen are mentioned and this did help a lot. For the third in a series I really started to love, this book was a little bit of a disappointment for me, however I’m not going to lie; a lot of that may be to do with the time between the first books and this one. The story of Beautiful Creatures and Beautiful Darkness was brilliant and I remember reallyenjoying it. I think the thing I loved most about it was the fact it was told from Ethan’s point of view, as the bystander to what was going on with Lena. This book is the same in that it is told from Ethan’s point of view but it was very much about him, the book follows Ethan’s craziness coming to terms with what happened in Beautiful Darkness with Lena and what is going on now. There’s a bit of a storyline with Amma and his family and there is a lot of stuff that he figures out without any input from Lena, which I seam to remember is different from the other books. I really enjoyed this story but i think the revelations took far too long to come to light and things I worked out very early on in the book didn’t get worked out by the characters until right at the end. There is a massive cliffhanger and I really want to know what will happen next but I honestly think that there’s a lot of fill-in in this book that if taken out would mean that the fourth book could be a part of this one. There seams to be a lot going on that doesn’t quite make sense and dones’t really need to be there but maybe its of more importance later one. I enjoyed what went on with the teacher at Lena and Ethan’s school but thought that it didn’t make that much sense as I had forgotten Ethan’s dad’s reasons for looking into the Eighteenth Moon by they time a lot of that came to light. There is a war raging in this book and a lot of it is between the Light and Dark, most of it could be construed as Lena’s fault for claiming herself and that blame would be correctly directed. However a lot of it has to do with actions much older than Lena, and I have to say I loved the storyline about Sarafine and Abraham – at least the insight into their past, anyway. I have to praise the authors again for brilliant writing and a very convincing voice in this series. Considering its quite a romantic story told from the viewpoint of a teenage boy I can honestly believe that he is a real character, with real feelings. I love Ethan and how strongly he feels and whilst his relationship with Lena is obviously a very big part of this book I love that he has strong relationships with his family, Amma and Link too. There’s a lot left wide open in this book and I’m convinced that we haven’t seen the last of some characters yet. I really am intrigued to find out what happens in the fourth and final book and I look forward to reading it. Whilst I am a bit annoyed that Beautiful Chaos took a long time to get going then had a full on rush at the end to wrap up the things it wrapped up, that hasn’t put me off continuing to the end of the series at all. 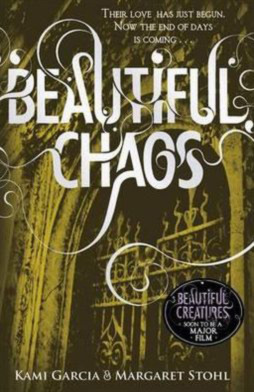 Beautiful Chaos was published on 18th October 2011 by Penguin. My copy was sent to me from the publisher in exchange for an honest review. A spin off from this series titled Dangerous Creatures, is due to be published on May 20th.